Marchers, including Jennifer Jones, center, mark the 10th anniversary of Hurricane Katrina by taking part in a remembrance and parade through the Lower Ninth Ward in New Orleans, Aug. 29, 2015. Church bells tolled Saturday in the U.S. city of New Orleans and across large swaths of the Gulf Coast as residents marked the 10th anniversary of the deadly Hurricane Katrina. Dignitaries in the hard-hit city laid wreaths and eulogized the the storm's 1,800 dead, while celebrating the recovery of the city and the resiliency of its residents. Residents of the city's rebuilt Lower Ninth Ward, which was devastated by Katrina, marched in a parade and listened to speakers describe the catastrophe and its aftermath. Former U.S. President Bill Clinton was expected to address crowds later at an evening ceremony featuring music and prayer honoring the survivors and first responders who struggled to bring residents to safety and curtail violence in the desperate days following the storm. 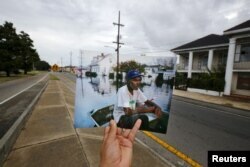 FILE - Photographer Carlos Barria holds a print of a photograph he took in 2005, as he matches it up at the same location 10 years on, in New Orleans, Aug. 16, 2015. Storm costs eventually were tallied at $150 billion. Thousands left the city and never returned. Many homes have yet to be rebuilt. Yet the city's famous French Quarter, where tourists flock for food, drink and music, has bounced back. Political leaders — including President Barack Obama and former President George W. Bush — boast of the resilience of the people of New Orleans. Bush, who was in office when the storm hit in 2005, visited the city Friday. The initial federal government response to Katrina is seen as one of the biggest blights on his legacy as president. 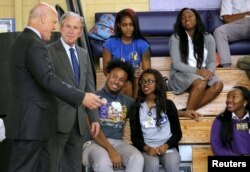 The former president stopped at Warren Easton Charter High School, the same school he visited on the first anniversary of the catastrophic storm. He was accompanied by his wife, Laura, whose library foundation helped rebuild what is the oldest public school in New Orleans. Bush addressed a packed crowd at Easton, quoting a local teacher who told him, "We teach our kids to be resilient." His administration was roundly criticized in the days following the storm for a slow emergency response to the thousands of people needing shelter, supplies and security amid the flooding. The administration later sent considerable aid to the devastated city and the region. Local officials, especially former New Orleans Mayor Ray Nagin and former Kathleen Blanco, who were in office during Katrina. were also blamed for a bungled response. On Thursday, Obama hailed the Southern city’s revival. Speaking to city residents at a newly built community center in the Lower Ninth Ward, he said, “You are an example of what is possible when, in the face of tragedy and in the face of hardship, good people come together to lend a hand. And brick by brick, block by block, neighborhood by neighborhood, you build a better future." “The project of rebuilding here wasn't simply to restore the city as it had been, it was to build a city as it should be,” Obama told a crowd of 600. “A city where everyone, no matter who they are or what they look like or how much money they've got, has an opportunity to make it." Obama, on his 10th visit to the city, remarked that New Orleans’ recovery was a model for the nation in urban innovation and disaster response and resilience. More than $14 billion has been spent to reinforce levees that failed to protect New Orleans.